The Columbus Dispatch has provided marketing tools to help businesses promote nominating and voting to their loyal fans. We encourage you to use the hashtag #CbusTopPicks, download and share the images to use on your social media promotions, e-newsletters, point of sale, company website... ANYWHERE! Keep checking for more additional marketing tools through the CBUS Top Picks process. To download: Right click (Control-Click on a Mac) and then "Save As ...". Out of more than 30,000 area businesses, the Columbus community voted for their favorites to be named a 2017 CBUS Top Pick. That’s a big deal. To be a CBUS Top Pick means people recognize you as one of the elite companies in town — a top 3 in your space. We wanted Central Ohio to tell us who they count on — day in and day out — for products, services and entertainment. To tell us which local companies are the best of the best. We are thrilled by the enthusiastic response of people who cast nearly 170,000 votes. We are excited to celebrate our top Central Ohio businesses and organizations, chosen by the people who live here. How can my business be listed on The Dispatch CBUS Top Picks ballot? A “Write-In” nomination process will be open from August 1-31. After the “Write-In” nomination has been completed, up to the top 6 companies and organizations with the most nominations will be listed on the voting ballot. Businesses will be checked for validity, so please make sure the nomination is submitted with the correct name and the category is appropriate. If a business cannot be verified, the nomination will not be published on the ballot. Can my business be nominated in multiple categories? Yes. Businesses can be nominated in all relevant categories upon approval. For instance, ABC Restaurant can be nominated for Overall Restaurant and Italian Restaurant. Businesses will be checked for validity, so please make sure the nomination is submitted in the appropriate category. If a business cannot be verified, the nomination will not be published on the ballot. Are there ways for my business to be promoted on the ballot? The Dispatch offers several unique and affordable ways for your business to promote themselves on this popular ballot. Ask your account representative for more information. What is the best way for my loyal customers to nominate & vote for my business in CBUS Top Picks? When is the voting period? The Dispatch CBUS Top Picks program takes place in 2 phases. Phase 1 Write-In Nomination: Wednesday, August 1 - Friday, August 31 at 11:59 p.m. Phase 2 Voting Ballot: Monday, October 1 - Wednesday, October 31 at 11:59 p.m. 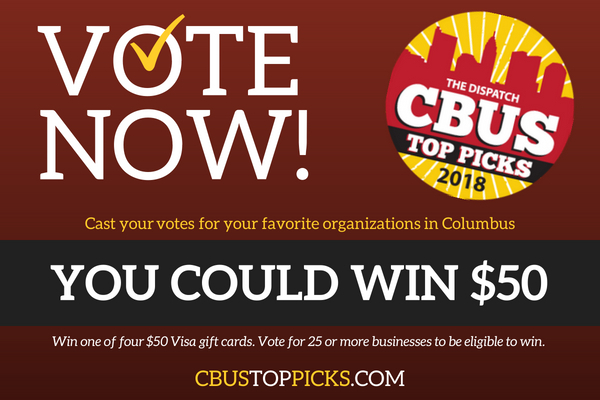 Phase 3 Celebration: The top 3 companies and organizations with the most votes will be named at 2018 CBUS Top Pick and will be contacted early November. CBUS Top Picks will be published in a special CBUS Top Picks Winners Guide publication in The Columbus Dispatch. A special event to celebrate the 2018 CBUS Top Picks is scheduled for Wednesday, December 5. What happens if my business advances to the Phase 2? Are there ways for my business to be promoted on the CBUS Top Picks Ballot? The Columbus Dispatch offers several unique and affordable ways for your business to promote their services. Ask your account representative for more information. Published in The Columbus Dispatch on Friday, December 22.